coffee – Why Am I Not There? 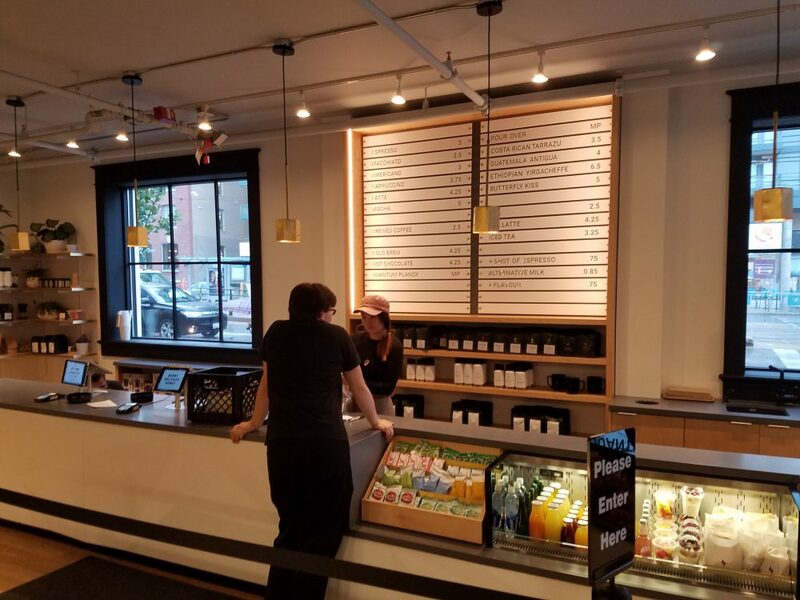 Coffee joints could be the best places to go local in a city. Tourists either go to Starbucks or to their hotel’s continental breakfast. Survey says …. LAME. No matter where I wake up in my travels, I have to visit, what I call, the “pretentious hipster coffee” places. The PHCs use terms like single origin, fair trade and sustainable practices. The location should be in a gentrified area or be a previous, unrelated business. More importantly, their coffee menu should be simple and a flat white/cappuccino should be one size and pastries should be Instragrammable. 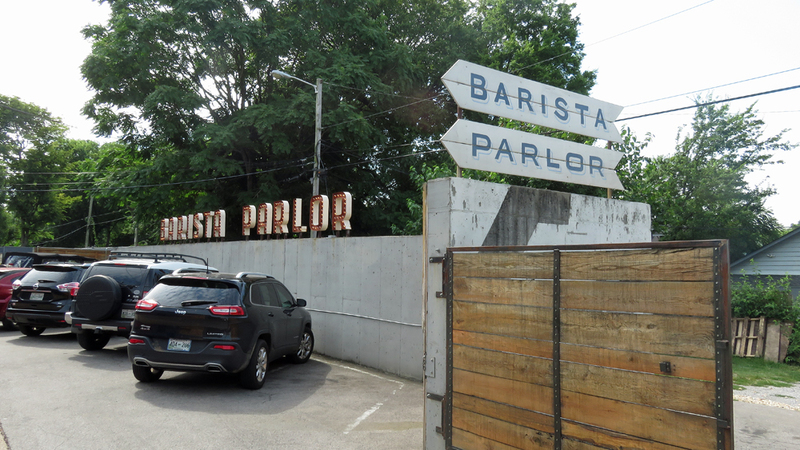 Barista Parlor in Nashville fits everything. Even when you throw out my criteria, the coffee was amazing. Coffee snobs can do the cupping thing and people who just want a damn cup of coffee will be satisfied. 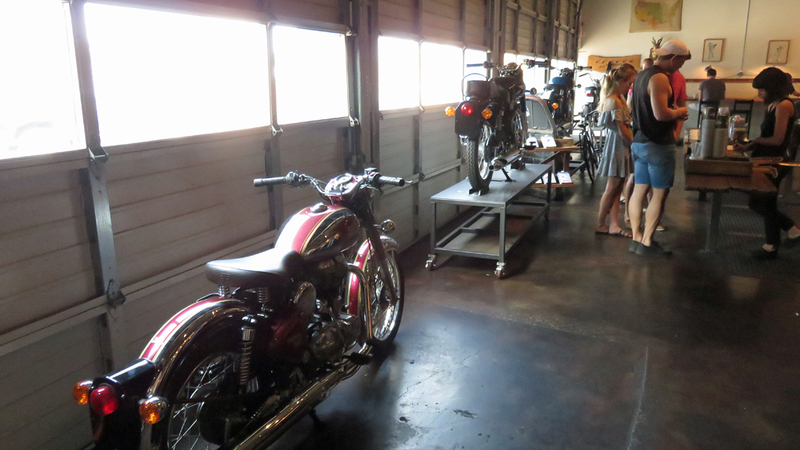 The original location in East Nashville is housed in a former autoshop just like imogene + willie (must be a thing). It’s on the same street (Main into Gallatin) as other similar trendy businesses and old school dive bars and diners. The spacious area is designed for those who want to have impromptu business meetings with long tables or like me, just want to interact with nobody and settle in at a long wood bar made with re-purposed wood. When you put in your order, you get a long stand with some fun picture number on it to take to your table, so they can bring your order out to you. 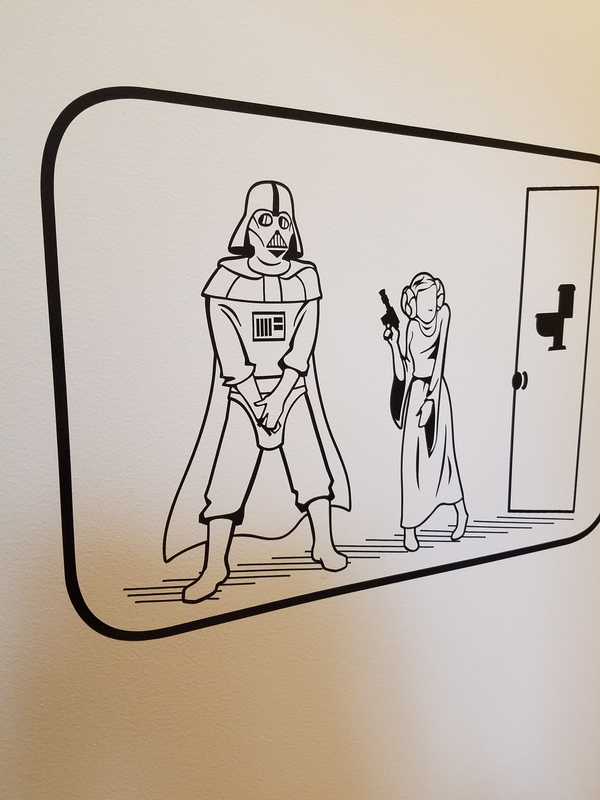 As you can see, the space is super fun, with art work, free to play vinyl, your odd knick-knack and brickabrak, and best of all, beans to take home. The box is in the shape of a motor oil can. As a warning, they do sell-out of their specialty beans, so take what you can get. I loved the place so much I went back again before I drove out of town. I just loved the retro-designs, the variety of coffee and gangster donut selection. I think it’s a must-visit even if you’re not a coffee junkie and just want to see a funky space. When I go back to Nashville, I’ll make a b-line there. There’s no chance that this coffee shop on wheels will ram into you while you’re enjoying your morning cappuccino, but you might get your head dinged a bit. Double D’s Coffee and Desserts in downtown Asheville is a beloved local oddity that shows the city’s offbeat quality. 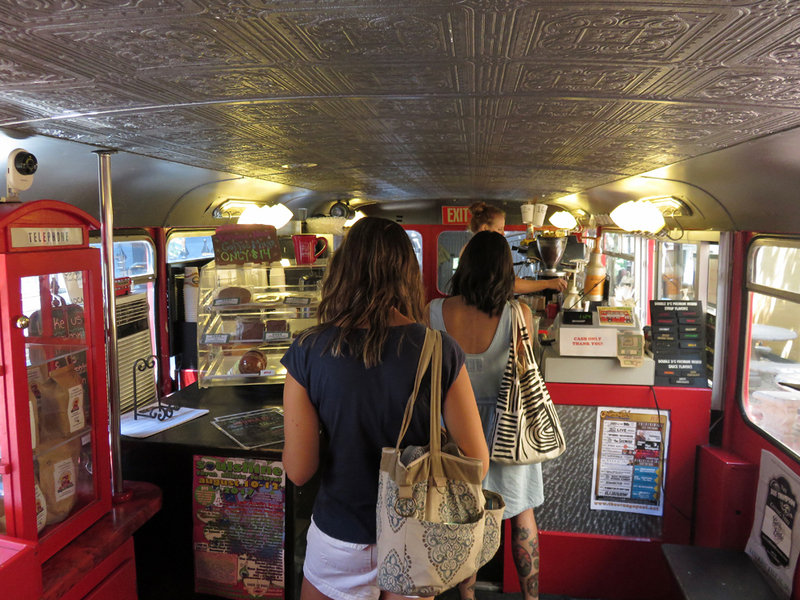 The re-purposed 1970s British bus turned coffee joint is nor only a fun little must-do in the city, it serves a damn fine iced coffee alongside local baked goods. The big warning for tall blokes like myself is that the ceilings are low. So when you go up the stairs to the inside seating, watch your noggin. There’s shaded outdoor seating as well, but the upstairs in a neat little nook. For kids, there’s coloring books to keep them entertained. Beyond the chicken wings, Frank Lloyd Wright house and the tailgating scene at a Bills home game (look it up … at home, not work), there’s a nothing much that’s a “must-see”. Once you get through the big draws, you can check out some early 20th century interiors while sipping a fine cup of coffee. Buffalo was once a major industrial hub in the early 1900s. If you saw Crimson Peak, you learned this. A quick drive around the nice neighborhoods and you’ll see some perfectly preserved houses from that era. The Hotel Lafayette was built for the Pan-American Exposition, where President McKinnley was assassinated. It went through a major facelift in 2012 to make the building a hotel, office, spa, brew pub and Public Espresso + Coffee. 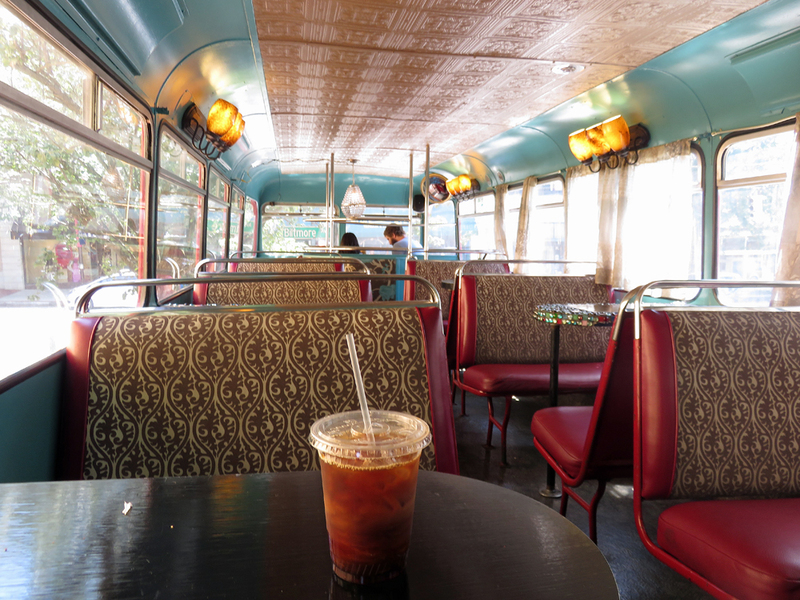 Getting a cappuccino gives you an excuse to wonder around and look at the retro interiors. Behind the coffee counter, you can see the old mail room. 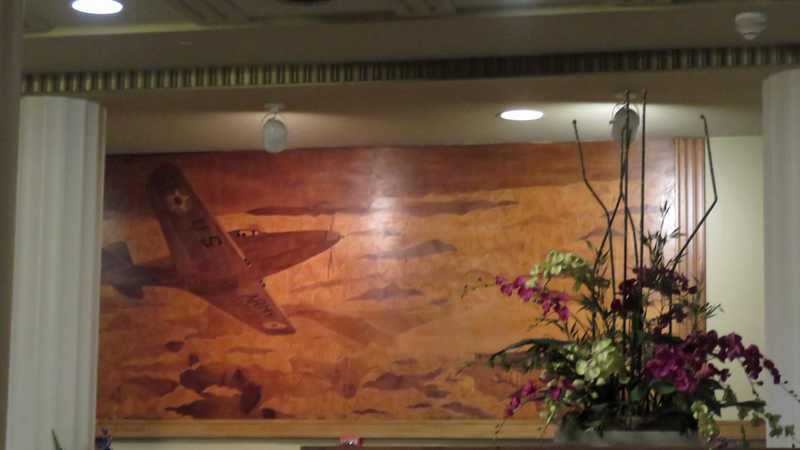 Above the main desk is a painting of vintage air travel. 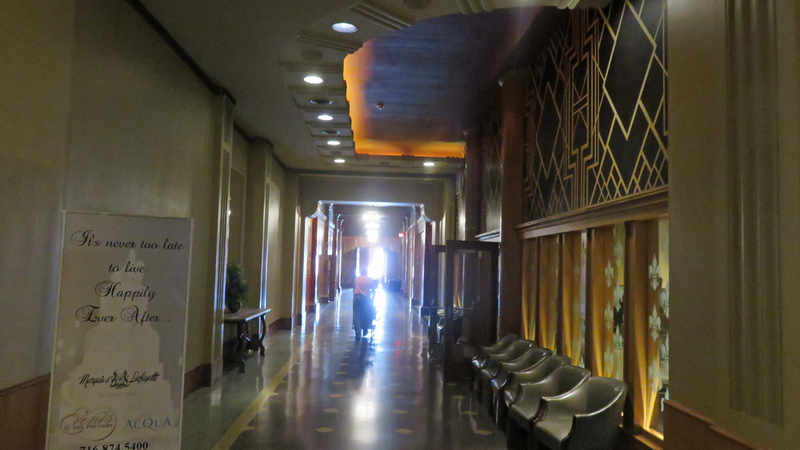 Around the corner is the elevator hallway where you can picture what the joint was like back in the day. 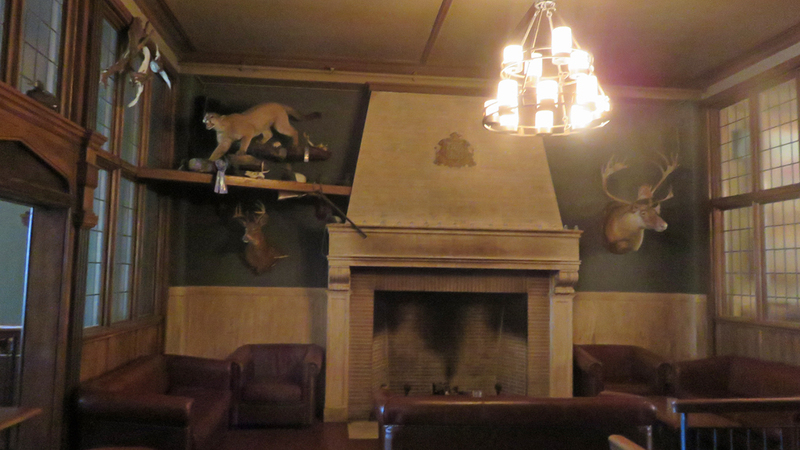 I poked my head into the Pan-American Grill & Brewery and saw all the wood fixtures and old timey hunting memorabilia. 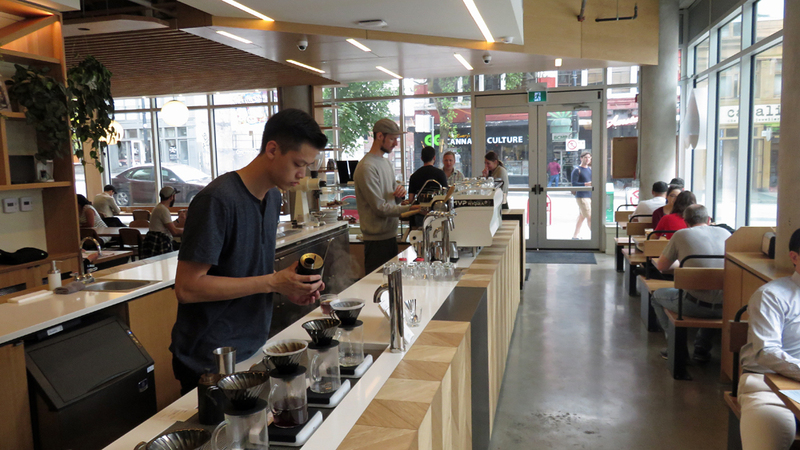 Looking at the other side of the style spectrum, I patronized two of the modern designed coffee joints in Toronto. 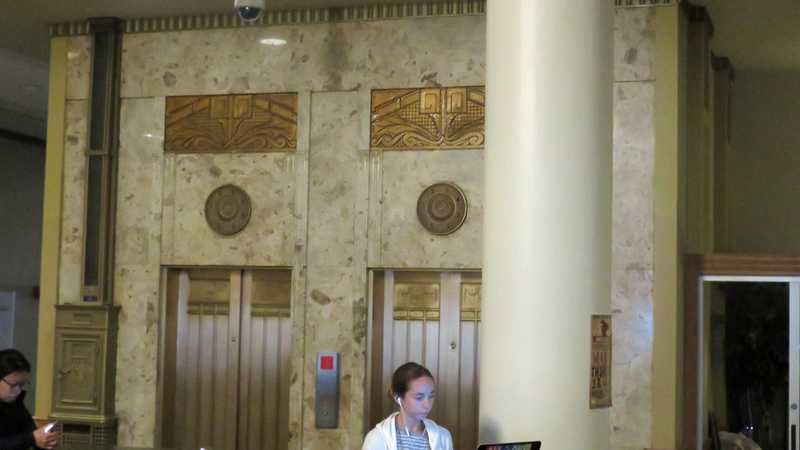 Previously, I looked at Balzac and Dineen, which featured old timey classic architecture, marble counters and brass fixtures. Reflective of the strong Asian culture found in Toronto (or Canasian as my co-worker says), Odin and Quantum borrow from minimalist designed you’d find in Japan. In turn, they were inspired by the rich wood interiors of Scandinavian coffee houses. Located northeast of the revamped and trendy Distillery District on King Street in the Corktown hood, Odin‘s ceiling will remind you of the Metropol Parasol in Sevilla. 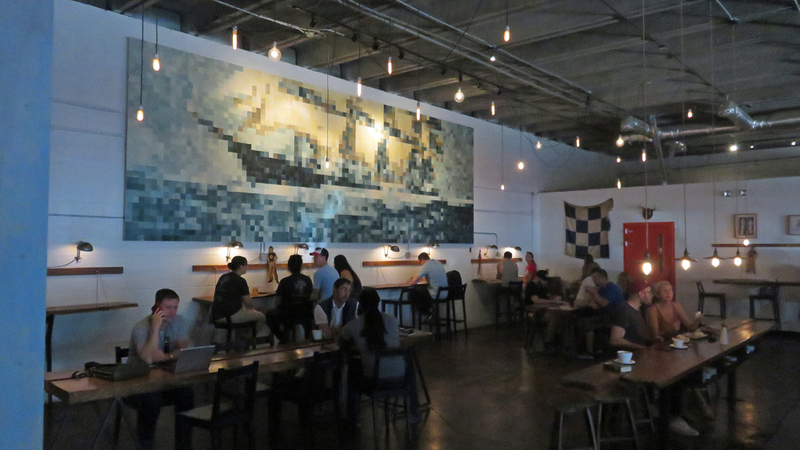 The white countertops you’ll also find in the Blue Bottle coffee chain. 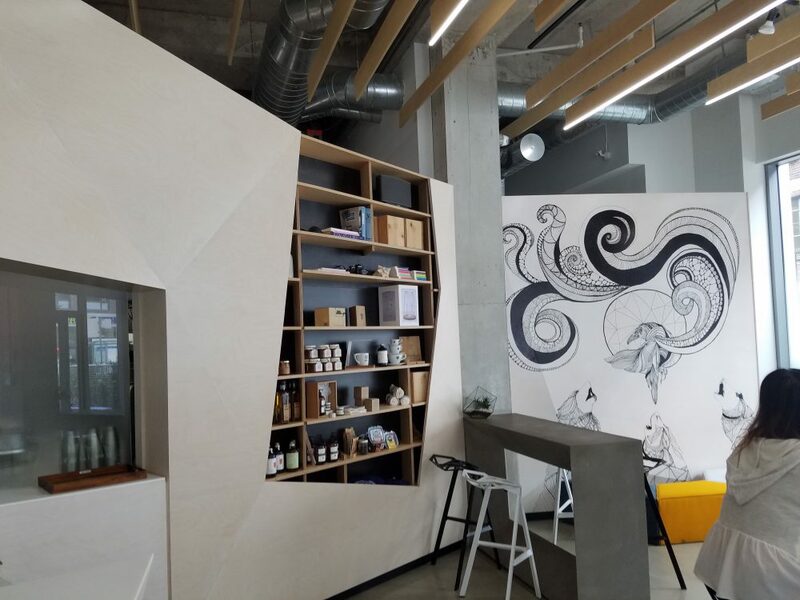 When you see the clean lines, the modern art, natural light and fancy espresso machine that costs more than my car, you know you’re going to get a fine cup flat white. The cafe also services sandwiches and local beer because sometimes you can’t decide between coffee and beer to drink. There’s also a connected outdoor space for the warmer months. They put some serious thought into this space. I didn’t know if I should drink my coffee or study the design plans. Architecture Daily has a lengthy look at the thinking behind the concept. Similar in color tone, Quantum roasts their own single origin beans. 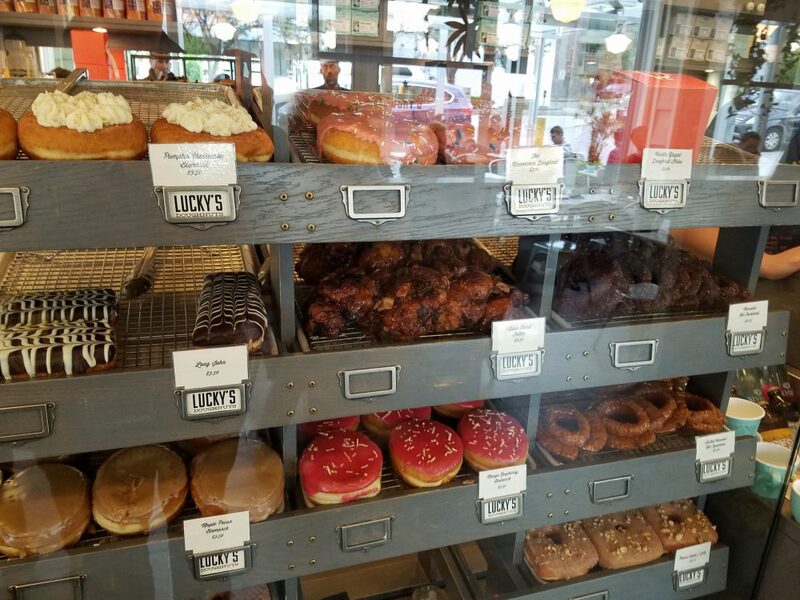 This is a more traditionally coffee shop with baked goods and light bites. 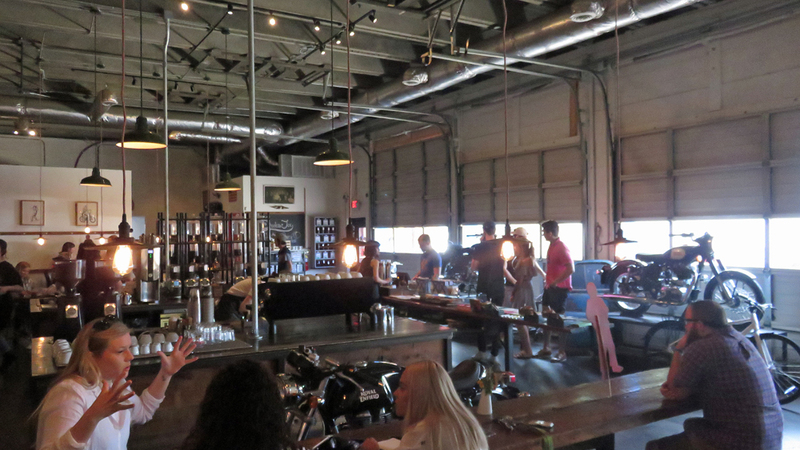 For their pour overs, they use a state-of-the art Pour Steady machine. I’ve seen one before and it’s basically a robot pouring water. Yet, another barista looses his or her job. 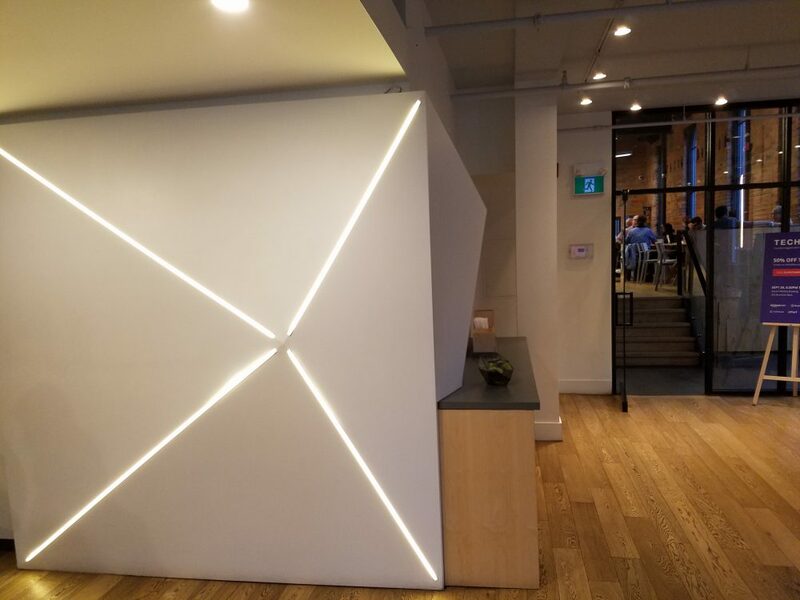 Located on the corner of Spadina and King Street but on the west end in Downtown, Quantum is connected to a high-end backpacker hostel. Not to get off topic, but if you’re staying in a high-end backpacker hostel, just stay in a damn hotel or AirBnb. Anyway, since the cafe is popular for college students and a nearby tech co-working space, the backroom seating area is filled with dudes and gals on their laptop working on the next big tech start-up that will ultimately fail. For this coffee bottle, I’m going with Quantum for the coffee and more centralized location, but Odin for the design. Comparing coffee places while traveling is more tolerable than taste testing donuts, ice cream, cocktails and beer. Thus, I take my coffee intake seriously. Good thing is that all large cities have a variety of coffee places to choose from. For most Toronto residents, they head to the hundreds of Tim Horton’s, Starbucks and Second Cup Coffee Co. during their morning commute. Others who want to savior their cup in a classy setting, they have a couple to choose from that I visited. I loved the typography and visual aesthetic at the small Canadian chain, Balzac’s. Founded by a Canadian who was on Dragon’s Den (a.k.a Shark Tank in the U.S.), the shops take their inspiration from 1920s-30s advertising. Each shop has their own coffee poster art. Their two-story location in the Distillery District has a retro-warehouse feel while their shop next to the St. Lawrence Market has a classic French cafe style. Both offer their beans to go, so I jumped on their Java Stout beans. Stout equals beer. Hmmmmm. Besides the cappuccino I ordered, I tried their cold brew with added maple syrup sweetness on nitro. Loved it. 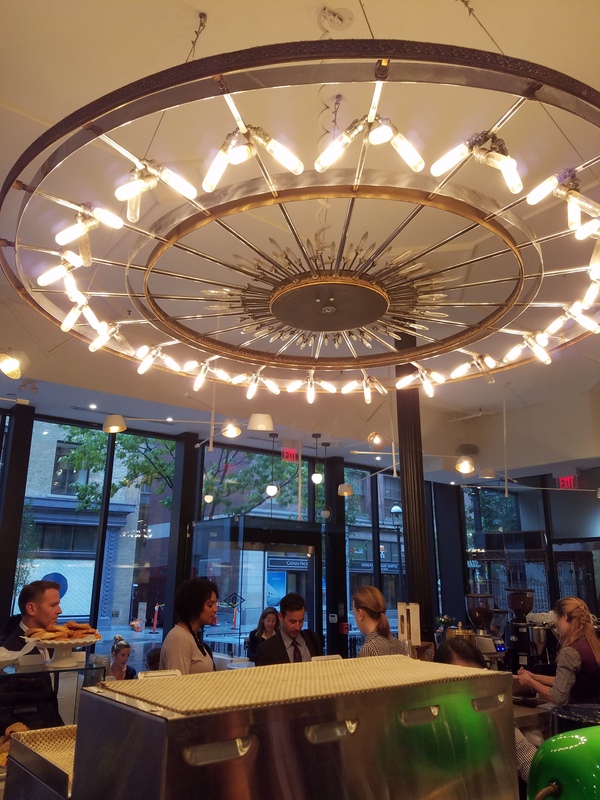 Founded in 2013, Dineen Coffee is a relatively new shop in Toronto. Located in the Financial District on Yonge and Temperance Street, Dineen is where local business people gather when they want to get away from the office. The space is stunning. It used to be a fur company and is listed as a Toronto Heritage Property . Thus, it’s a popular place even after the morning rush hour. Expect to wait for a stool at the bar or table. If you’re lucky enough to get a space, you’ll linger at the brass and marple while ogling the elaborate lighting fixtures. When I asked about the beans and flavor notes (yeah, I’m the nerd who asks), they were more than happy to guide me to what I like. It’s a tough call, but I’m giving Dineen the edge. I liked my cappuccino there because they offered one sized, the way it should be. This would be my go-to place if I lived in Toronto. On the other hand, that cold brew from Balzac is mighty tasty, and you’re more likely to find a place to sit. There are people in world who say they love coffee. They say, “Oh, I can’t function without it,” then they go to Starbucks. They don’t like coffee. They like convenience and being brainwashed by horrible corporate coffee. For those of us who treat coffee as an almost an enlightened experience — a fetishistic pursuit — I give you the Coffee Collective. With three locations in Copenhagen, the Coffee Collective take a scientific and artful approach to drip coffee, espresso-based drinks and roasting. You can drop their name to even the most hipster of all baristas and sound like a boss. “Yeah, this is good, but it’s no Coffee Collective.” Then watch the tattooed beardo cry. I visited all three in my visit in 2012, and it’s good to see that they’ve remained humble and kept it to three locations since. They have different designs, but keep the quality consistent. The original location on Jægersborggade feels like your stepping into somebody’s apartment. There’s a handful of seats against the wall, a few tables in the backroom, no counter and the small roaster is in the tiny main room. It’s a personal experience where the barista talks to you in detail about your coffee. 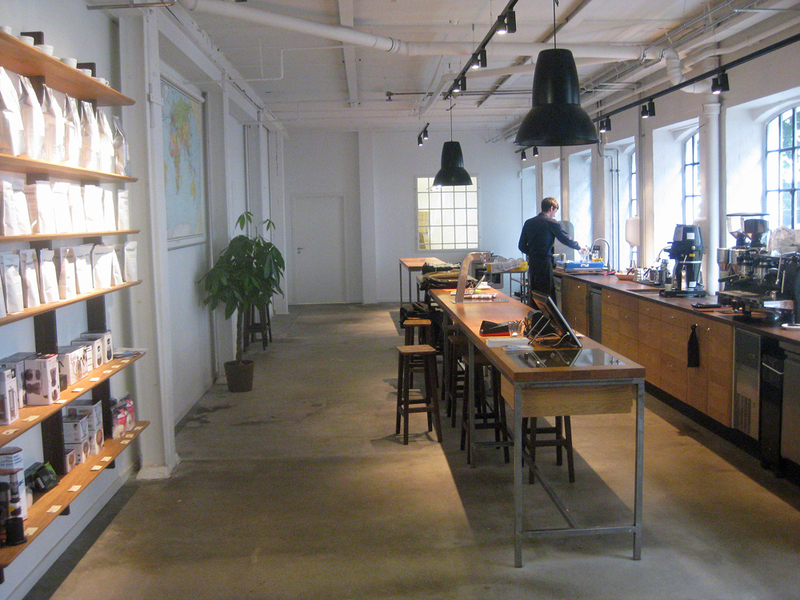 The big, main location and roaster is on Godthåbsvej. This is where get the full experience with a space that exudes minimalist Danish/Nordic design. You’ll fine wood countertops, white walls, large windows that allows for plenty of natural lighting, raw floors and a touch of leather in the seatings. Like the original Jægersborggade location, the open counter at the the main location allows for the barista to treat you like a guest without anything separating you from the brewing experience. If you get a drip coffee, it will brewed right in front of you. Then you can see your espresso being made in full view. The Kees Van Der Westen espresso machine probably costs more than my MINI Cooper. 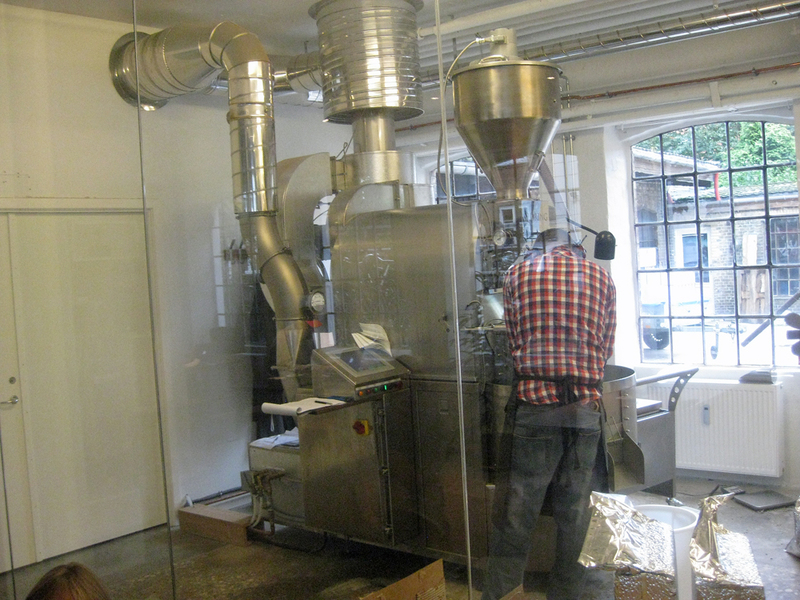 At the main location, you can also see the high tech roasting experience where temperatures are closely monitored. The workers and baristas have a long list of awards in the World Barista Championships. The third location is the most accessible and thus busier at the Torvehallerne Food Hall. Also a great example of modern Nordic design, the food hall is a one stop shop for foodies and the like. 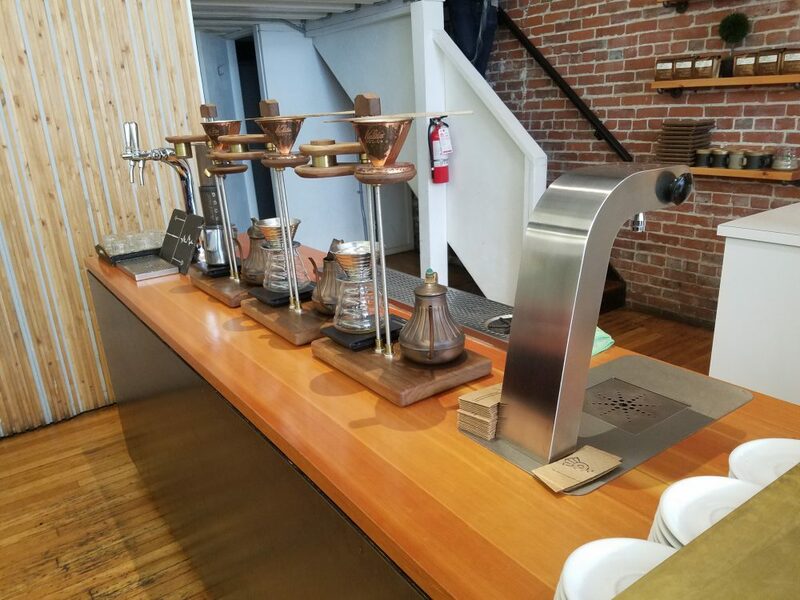 The Coffee Collective counter is your more traditional set-up with a counter, to-go cups and pastries. It’s a good place to sample and grab a few bags of beans to go. I got five bags when I visited the locations. When I was done with the beans, I even kept the bags. Coffee beans are great to buy when traveling because they are easy to pack and make your luggage smell nice. So how’s the coffee? It’s like tasting your first cup of coffee. It is a religious experience where you’re tasting the flavor notes. Drinking coffee there is like experiencing the best that Mother Earth has to offer. Granted, Italy still has the best coffee and cafes, but damn if Coffee Collective isn’t the best coffee in Europe outside of Italy, then I don’t know what is.